Click on the link to go to that page or site. Use your BACK button to return here. Experienced a scam from a scammer not in your country? econsumer.gov is a partnership of 34 consumer protection agencies around the world. FTC's Information on the FDCPA - Fair Debt Collection Practices Act for those threatened with a lawsuit. If you gave your credit/debit card number to a scammer, phone the number on the back of the card, and inform the issuer. 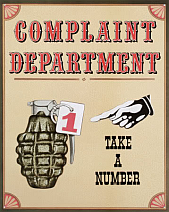 If you want quicker results, or if the complaints have been ineffective, then YOU must protect YOURSELF. Return to Index Page for more good information to protect yourself! This site is hosted by free webhosts. The internet address may change. phonehelp.2truth.com will redirect to the current webhost.